If you are like most home business owners, you would like to make more money. There are many expenses involved when you are self-employed. At times, it may seem as though all of your hard work isn’t worth it because at the end of the day you really aren’t making that much money. There are ways to examine your efficiency and ensure that you are making the profit that you deserve. 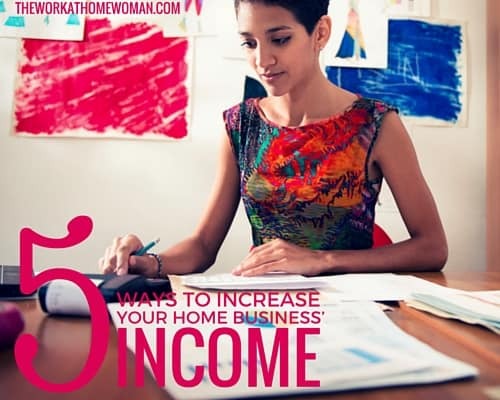 Below are five ways to increase your home business' income. 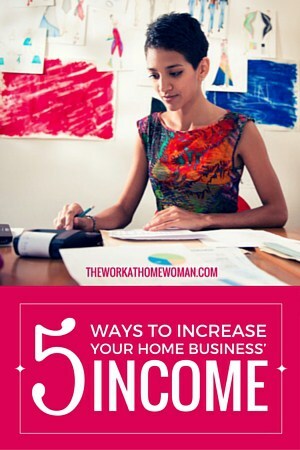 Lower Your Expenses and Overhead. Every business has expenses. There is no way around it. But, the more you can keep them to a minimum, the more you’ll see your profit increase. I recommend taking a good, hard look at what expenses are necessary and cut the ones that aren’t. This might be easier said than done. A phone line and wifi are necessities. But, an extra phone line to use as a fax? Probably not. Office supplies and furniture should be kept to a minimum. Use comfort as a guideline. Can you get your job done comfortably without it? Then forgo the purchase. If you stock inventory, it may be difficult to minimize your overhead. Obviously, you need to accommodate large orders when they occur. How often is that? Be sure to research trends in your business as well as planned marketing efforts to best plan what inventory you need to have on hand. Extra inventory means extra expense and less profit. Depending on your business type, it may be possible to switch completely to a drop ship format and get rid of inventory and overhead altogether. This can save time, money, and space—all leading to greater profit. What are you charging? Many business owners cringe at the thought of raising their rates because they think that could automatically mean the loss of clients. That is not necessarily the case. Charging appropriately is imperative for several reasons. If you overcharge, you can drive away almost all potential customers. However, undercharging can be just as dangerous. If you undervalue your work, so will others. You get what you pay for and nine times out of 10, people understand that. They expect to pay an appropriate price for proper service. If you are underpriced, it can signal less than stellar services or unprofessionalism. Working and not getting paid will dramatically affect your profit, and that’s what happens if you are not charging appropriately. Working for free doesn’t make sense, and if you have poor time management skills, this is exactly what can happen. Work smarter, not harder is an old adage that is appropriate here. If you manage your time wisely, you have more time to take on more projects and customers. You also make yourself look better to new and potential clients because you work effectively and quickly. Some easy things that you can do to improve your time management skills are make lists, set deadlines, delegate, and stop multi-tasking. Many think that multitasking can increase productivity when in reality it is distracting and can lessen your quality of work. I recommend focusing on specific tasks and working to finish them within realistic deadlines. Also, use your downtime. If you are waiting for a training to start, for instance, use the time to catch up on emails or reading. Keeping yourself organized can have dramatic effects on your workload. I encourage you to take notes and track your improvements! Typically, word of mouth is the best advertising you can receive. This underscores the importance of strong customer service. The better you treat your customers, the more likely it is that they’ll recommend you to their friends and family. Making your clients feel special will make them want to tell others about their experience with your business. This is the best free advertising than you can get. It doesn’t take additional time or extra supplies. It only takes kindness and respect. Clients will be drawn to this, and business will increase. Offering perks and coupons to your existing client base can also have a dramatic impact on your bottom line. Treat your customers like you value them, and they’ll become even more valuable. When the term ‘upsell’ is mentioned it can sometimes carry a negative connotation. However, there is definitely a way you can upsell in a respectful way that will increase your profit. Respect your customers, their budgets, and limitations. If you truly understand your customers, you’ll have a good grasp on their needs. Suggest things that they need and legitimately make sense at their stage of business. And suggest them in a way that is supportive and not intimidating. This will increase the respect your customers have for you. And, if it doesn’t immediately translate into a sell, there is a good chance it will in the near future. Relationship building is a huge component of business, and showing a client that you understand and value their needs it can help cement that relationship. Dawn Berryman is the founder of MarketMommy.com and Market Mommy:: The Blog, online marketing resources for mom entrepreneurs. Market Mommy shows moms how and where to market their businesses. She holds a B.A. from Indiana University and has worked in the marketing/communications field for more than 11 years. She resides in rural Ohio with her husband and three children. For more information, please see: Market Mommy. Great blog post Dawn! I think it’s safe to say that you’re advice is great for moms but also for dads that stay at home! Thanks again for the great work and advice! Glad you enjoyed Dawn’s tips, Robert!